Years after Christian Eiroa sold Camacho Cigars to Davidoff of Geneva in 2008, he decided to return to the cigar industry with new blends that begged the question "why not?" and broke from the norm. Christian's CLE Connecticut cigars are a perfect example of both. 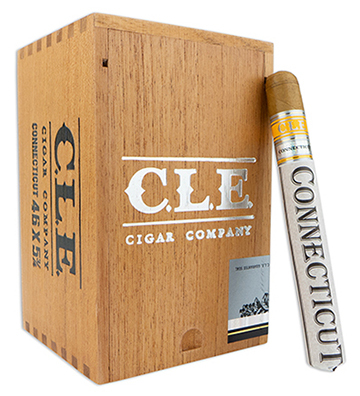 While CLE Connecticut cigars are mild to medium-bodied as most Connecticut blends tend to be, they are deliciously unique with a remarkably bold and evolutionary flavor profile. Beautifully handmade in Honduras, the CLE Connecticut's golden Ecuadoran Connecticut Shade leaf covers a long-filler blend of Honduran, Nicaraguan, and Peruvian tobaccos bound in authentic Honduran Corojo. These smooth and mellow cigars are balanced, complex, and mildly sweet with a touch of pepperiness and notes of grass, roasted nuts, cream, baking spice, citrus, and oak.